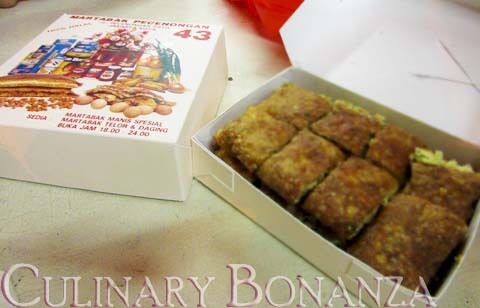 A trip to Pecenongan is never complete without having the martabak (Indonesian pancake) for takeaway. 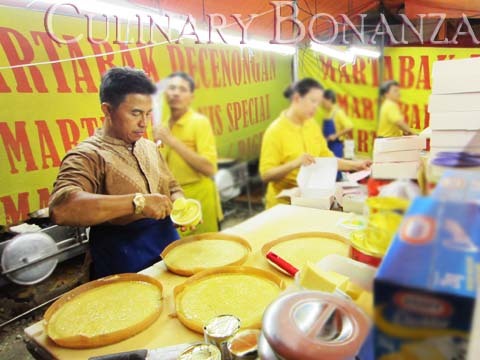 Martabak is a favourite supper fodder for the locals, despite its jaw-dropping calorie-content, (no) thanks to the slab of butter, margarine & fillings used! That is why most of them (at least the famous ones) are only open for business after sunset, all the way until the wee hours of morning. 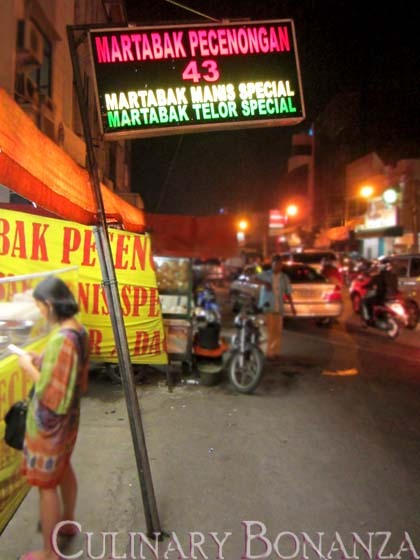 Located on the same street as the 2 stalls in the previous posts, Martabak Pecenongan 43 is quite easy to find, which is just 2 stalls next to Sop Kaki & Sate Kambing "Krekot". I was intrigued when a friend told me that 43 is better than 65A, so I decided to test her statement. Ø Spesial - more Wijsman than Blue Band, hence more expensive. v 43's sweet pancake is not very sweet, because they pack less volume of fillings (aka: pelit), hence you won't feel sick quickly from eating more than a few slices. Plus, I personally believe that 43's is more doughy & tender. v 43's savoury pancake is thicker, more fluffy and less salty, so you can eat more of it, without the need to guzzle lots of water to neutralize the salt in your mouth. v 65A has more combinations of fillings that 43 doesn't have such as: raisins, corned beef, mushrooms, tuna, etc. *) No Tax & Service Charge. Only for takeaways. If you see this leaning sign, then you're at the right place! Can't agree more with Dr. B!! No pancake in this world, taste better than martabak. Funny article here: http://agirlhastoeat.com/nasi-goreng-indonesian-pancakes-jakarta/ a female food blogger from UK finished one whole loyang herself when she came to Jkt and that wasn't even pecenongan ones. Spesial - more Wijsman than Blue Band, hence more expensive. What do you mean by more X than Y? It should not contain any margarine/butter in the pancake batter itself and the filling is either blue band margarine or wijsman butter but not both. Most importantly, how do you know that one is INDEED better than the other, if you are not doing back-to-back comparison? Unless compared side-by-side, it's difficult to differentiate very similar products. @Anonymous: Thanks for dropping by & left a comment here. I merely quoted what the vendor who explained to me what the difference was, verbatim, not more, not less. My cousin was there with me, he could vouch that I didn't make the theory up. 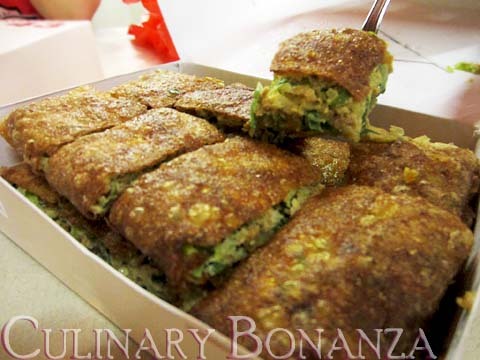 "oh my good, martabak is THE ultimate champion of sweet food. 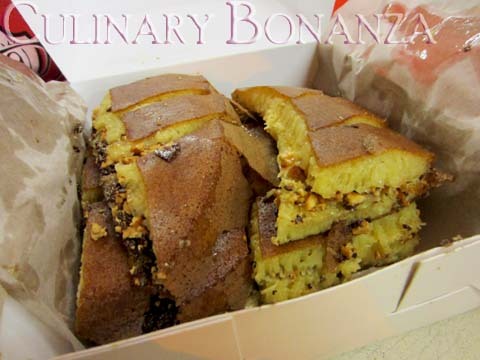 no matter how good a red velvet or cheesecake of whatever fancy cake out there, martabak is the winner"
It's not fair to compare martabak to typical cakes, because cakes are mostly sweet, whereas martabak is a combination of sweet & salty. Two against one! No one can make a proper red velvet here, because original recipes use buttermilk (which is not available here because buttermilk goes rancid very fast, just like you cannot find FRESH American or Australian milk here). Also, to make red velvet with very delicate texture, you need special pastry flour which is expensive and probably impossible to find here. Americans call this Wondra flour. I don't think anyone actually make good cheesecakes here. The original New York cheesecake recipe uses Philadelphia brand cream cheese. A lot of people think this makes the best cream cheese (don't have to believe me, try it yourself). It is available here (rather difficult to find though) and very very expensive (it's the most expensive cream cheese here). Most people here use the local Yummy brand, I have reason to believe that Cheesecake Factory who claims to sell "best cheesecakes in town" use that. I know you've tried the other one. What I am saying is you should try them both side-by-side. You should have BOTH 65A and 43 in front of you. Take one bite of 65A, and then drink some water maybe, then take one of 43. Drink water and then repeat this as many times as you need before you make your final decision. This is how you compare very similar products. Your objection upon Ellyna's comparison method would've been legitimate if she's paid for this job, which unfortunately she's not. For me, one of the quintessence of a food blog is the subjectivism of the writer, that of course would even be better if supported by adequate reasoning; but in this case, I think Ellyna already does an awesome job. As for red velvet over here, it's supposed that red velvet here isn't as good as the one in the states accordingly to availability of ingredients. But I think Convivium's fell by narrow margin compared to Sweets, The Cheesecake Factory, or Magnolia bakery's. So I think what Aris's personal preference about martabak over red velvet is pretty legit. ps: I'm an advocate of red velvet > martabak.